Beautiful March is here, the weather is sunny but it is still very, very cold. I don't remember March being quite like this for a long time, but then again, I have a very short memory! The light outside is harsh and bright, there is so much white snow all around, that the light just bounces back and forth from every surface and it is quite difficult to be caught in the middle of this. Sunglasses are a must but at times even they are not enough, and when I step outside I feel like I am a blind mole stepping from my cave. Yet I cannot stay inside, I must take my snow shoes and make little rounds. When I finished the mittens I had to take a short break from the knitting. Those two weeks with constant knitting just took their toll and I have had to let time pass and not until last week end did I feel a strong pull towards knitting again. At some point I will come back to the mittens and will try to make them into patterns and I am thinking up ways to write something about embroidery, but that also in the future. 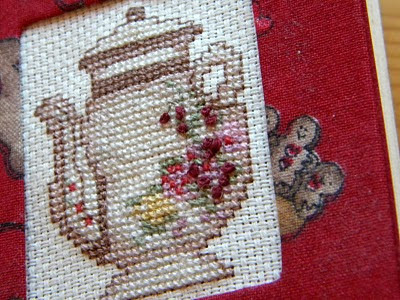 Detail from a handwork bag, possibly my first cross stitch from the first or second grade. Thank you for all your comments about the mittens and your questions about them. I used for all the embroidery my old trusty embroidery yarn that comes from the Renaissance Dyeing. Their quality and colors are just so high that once I came accustomed to them, I have never found anything that has come even close to the them. 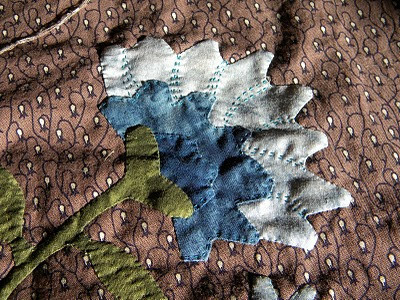 And really it is the beautiful color palette that makes the embroidery almost radiant. I try to answer some of the questions now and will come later back to the ones that I leave out of this post. The pictures in this post are from various embroidered things I have around the house and that were easy to take pictures of. There are plenty hidden away in boxes and I did not do any digging so these are just a thin layer. I don't say this to boast, but to let you know that I have been doing little bit of embroidery here and there over several decades and to encourage you to try all kinds of pieces, every single one is going to teach a valuable lesson even if it is just a few stitches. When embroidering mittens, I very often draw the design on paper first to see the size and shaping and then while drawing I will also think about the stitches. There are few stitches that feel "right" to me, it is almost like when you write, you have your favorite pen or pencil that you reach for. Chain stitch is my stitch, although I do like blanket stitch almost as much. When I have decided the main lines of the design I will draw it on the cloth with yarn and needle. I usually never draw on knits, woven cloth is different, but since the designs intended to embellish knits are usually small and simple, it is not necessary to transfer the design with any other media but yarn and thread. Once I have the basic shapes on, I will fill the empty spaces with stitches. Very often I end up embroidering with different set of colors than what I first envisioned. I like to keep the process flowing and open and flexible and try not to make too hard boundaries, after all the process has to be interesting and also fun or enjoyable. Since I use small gauge often or use twined knitting as back ground, I don't use any backing material. I like to keep the knit fabric as much as possible the way it is although it is bound to get a little bit stiff after all the extra yarn that is put on the surface. Why line twined mittens? The yarn I used for the twined mittens was my handspun and it is not soft and nice wool, but something on the coarser side. I have very thin skin in my hands and get deep cuts from the freezing temperatures, so I really cannot wear anything hard on my hands plus when it is -30 C outside, really one layer is never enough. I think that the twined mittens with lining are warmer than these double knitted mittens, the main reason really being the fact that twined knitted fabric is dense while the normal knitting lets the wind blow through more easily. I knitted the grey mittens with the blue lining both mittens at the same time. The motif on the outside with blue is knitted in grey in the inside. I guess this technique is called double knitting. My English is not correct, it must really be quite bad and elementary school like often (Finnish is my own language), so please forgive me for misusing the terms at times. I try to check what I write, but am blind to the mistakes often. I guess this answers most of the questions from the comments. I know the embroidery book list is something I have promised to make, but before I can do that, I need to organize my stuff a bit. Right now I am knitting socks. Loving every single minute of it. But more of them next time. 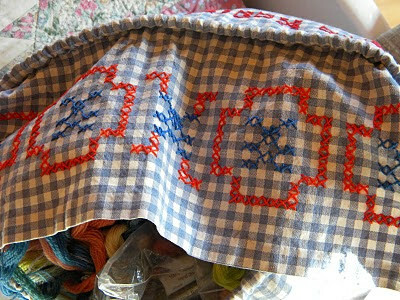 Thank you for another interesting blog entry and for the beautiful stitch examples! Some years ago, I used to stitch a lot and even did my own designs (and even sold some to Coats) but I never stitched on wool. A dear friend (she is from Sweden, but living in Germany) will acquire the Swedish stitch book for me you have mentioned in one of your earlier posts. I'm so looking forward to it! That's a gorgeous collection of your work. I love to cross stitch but have to admit I haven't picked it up in about 3 years. Knitting and crochet have taken over my brain. I love to scrapbook too but that seems to be left on the back burner too. Your english is wonderful. I can't make a single sentence from another language and am in awe of anyone who has a second language. I adore your mittens. With temperatures so low it must be essential to have good mittens, hat, scarf, boots etc. It must also be a joy to wear the ones you made yourself when you have such impeccable knitting standards. I especially like the ones with the thick cuffs that look like fur. 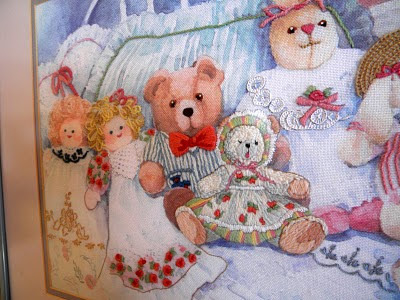 I enjoyed looking at your embroidery and may even try some myself soon. Knitting is my passion, but sometimes I need to take a break, and it is good to keep other creative muscles exercised .... I don't want them get stiff and creaky! Your English is very clear, and for me the little differences in expression add to the charm of your writing voice, Lene. Thank you for sharing with us! As always, I love what you share with us, in pictures and in words. Have you ever tried to make temari balls? A Japanese craft--small balls wrapped in thread and embroidered with perle cotton or wool. The designs tend to be geometric, but I have also seen some lovely free-form work. It is a good alternative for me when I need a break from knitting, and it is fantastic for playing with colors. Enjoyed seeing all the different embroidery projects, lovely all. 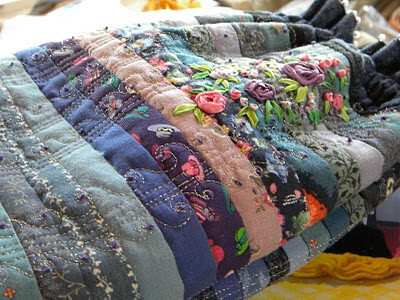 and the quilts. I used to spend a lot of time embroidering in my youth and had to really shake off the dust when I started the little patch for Lilleput. Now I remember why I enjoyed it so much. Your writing is better than fine. they are very cute. I like them! Lene, your English is almost as perfect as your needlework. You make small mistakes sometimes, usually due to the peculiar sentence structure a particular verb requires in English, or an idiom that you get slightly wrong. What is amazing is how *well* you get the sense of the language - the overall effect of words and phrases. Thank you for sharing your work with us and being willing to use an unfamiliar language to do it - your blog is such a gift! I always look forward to your next post. No matter the content, it's wonderful reading and I appreciate your sharing of time, projects, and knowledge. Your knitting is absolutely beautiful-- and inspiring. Because of you, I have learned the basics of embroidery. So far, I haven't tried it on knitting (but prettied up some pillow cases! ), but plan to do so soon. Any ideas or suggestions are always welcomed and very much appreciated. Also, I am intrigued by your mittens with the decorative thick cuffs-- I have not yet found a pattern discussing that technique--any suggestions? It's a gray day, here in Atlanta, overcast, with some light rain from time to time--perfect for knitting and practicing embroidery! Your English is awesome! I didn't realize it was not your first language. We Americans are sorely lacking when it comes to knowing other languages, and yet we expect everyone else to know ours. Ah, well. Lene, thank you for another post, I so look forward to them. And it is encouraging to my own efforts to learn that, even for you, the vision does not spring automatically from brain to hand! I love that you work so hard to achieve perfection in these "small" objects. Love your posts Lene. 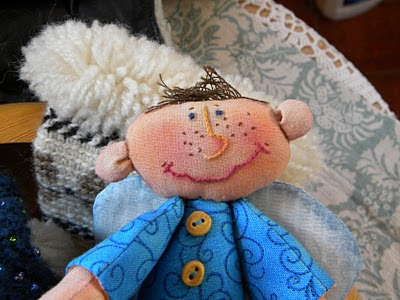 You've reminded me of the fun of embroidery, something I did long ago - and I still have the book I used. What beautiful work you have done! Your home must be really beautiful with all those lovely thing in it.I have been reading your blog now for a while and always look forward to reading you new posts. Another great post. I'm passing on the One Lovely Blog Award to Dances With Wool. I've enjoyed your posts, photos and insights. Thanks for all your effort. I love omnibus posts like these. You worry about needing perfection. I worry about my lack of worry over imperfections. So it is that the world stays in balance.